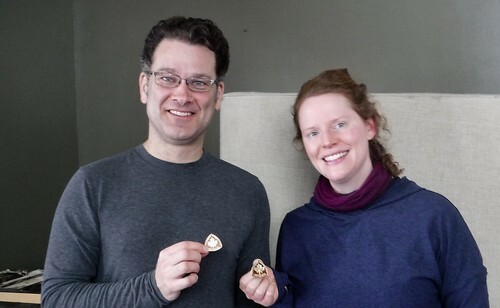 We're Adrienne and Adrian from North Toronto Ski Club and we became CANSI Level I Classic instructors this winter. 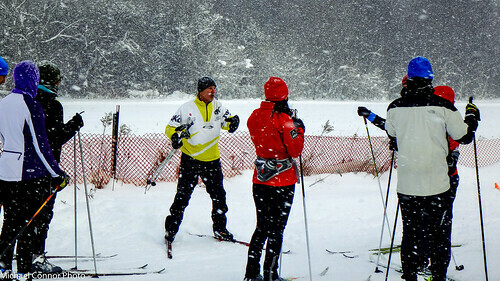 We were members of the excellent CANSI Level I certification course at Highlands Nordic near Collingwood Ontario. Adrienne: I grew up downhill skiing and didn't realize the joys of skiing uphill until a few years ago when I joined my cross country ski club. I immediately loved the sport - the beauty of the snowy forest, the challenges of the varied terrain, and the excellent company. At the time, I certainly didn't think about ever being an instructor, I assumed that was reserved for marathon runners - skiing well was so difficult, and they made it look so easy! As I learned proper technique, gained confidence, and saw small improvements in my own skiing after each lesson, I had so much appreciation for my instructors as great teachers (as well as excellent skiers). Adrian: I moved back to Toronto in 2014 from a long stay in the California Bay Area. Having lost my acclimatization to the Canadian cold, I realized that it was a question of survival in my new(old) home to actively embrace winter in some way. I thus took up cross country skiing in the winter of 2014/15 and joined my cross country ski club soon thereafter. I fell in love with the sport -- the climbing, the speed, feeling nothing but warmth and sunshine while in actual fact it's -20C outside. A big part of my love for the sport is learning, and slowly but surely succeeding at, ever more sophisticated technique. I have had truly wonderful instructors at my club and in the CANSI courses I took this year -- motivating, challenging, technically excellent. I consider myself 100% a product of their teaching! As we had been enthusiastic ski students for two seasons, our club's head instructor asked us if we would be interested to train towards becoming instructors ourselves. We thought this would be fun and a means to improve our skiing further, as well as a great way to give back to our club. The support and preparation for the Level I course that our club provided us was great -- one-on-one training, lessons with CANSI-certified guest instructors, and the Level I Preparatory Course at Highlands Nordic in December 2017. During this process, we caught our first glimpses of the world of CANSI -- the activities organized and promoted by CANSI, its goals and practices, and above all the dedicated and passionate individuals behind CANSI. We were very impressed by the high standard of pedagogical and technical excellence required for the Level I certification. This was amply demonstrated in the two CANSI courses we took this year --- Level I Preparatory Course and the Level I Certification Course itself. The first course set the bar high, while the second course challenged us to meet the standard. Our instructors in these courses (Peter Rasberry and Dave Wallin for the first; and Jay Thibert and Gavriel Lakhozviansky for the second) were tough on us, yet provided us with a wealth of knowledge about technique (always with an emphasis on how to communicate that technique to our future students) and were very enthusiastic and supportive all throughout. CANSI principles such as the pyramid of foundational skills (Stability and Balance, Power and Propulsion, etc.) and Motion on Skis were very helpful to us and useful for framing our ski lessons. It is clear that CANSI instructors are well-trained people!! We are proud to joining their ranks and we are looking forward to playing a more active role in the world of CANSI in the years to come. We would strongly recommend anyone interested in being a CANSI instructor in the future to speak to an existing instructor at their local club and/or sign up for the CANSI level 1 prep course in December. This was critical in our experience - it showed us exactly what was expected of our skiing and teaching abilities, and it provided all the feedback we needed to train over the season leading up to the certification course. Adrienne Marcotte and Adrian Butscher are CANSI Level I X-country instructors with North Toronto Ski Club of Toronto, Ont.